Fear Aggression, yikes! In response to the heartache of having this problem and all the emotions of having a service dog that needs serious training to correct this negative and unacceptable behavior. In any situation barking/growling at men and even in public, is never acceptable in a Service Dog. I have decided to share the survey responses from a survey I created to get the common answers of others who have a service dog to better understand what is normal and what is not when service dogs are delivered. She is clearly not ready for Service Dog work and cannot go back in public until this behavior is corrected. We have chosen a new trainer and will keep you updated as to her progress. "There can only ever be one BLUE." believing even when you have no evidence. *How old was your service dog when delivered or you went to get it. *Did your Service Dog have pee/poop accidents in your home in the first month? *Does the Service Dog meet your families expectations from the information your trainer gave you? *How much time do you spend training with your Service Dog, not walking or play actually training for task? *How long did it take for Your Service Dog to Adjust to your family? *How many specific Service Dog Commands did your Service Dog come home with? My Service Dog does not meet my needs yet. 1. A Service Dog can be successfully placed at a cost of up to $15,000. 3. Peeing/Pooping in the house is consistent with incomplete training. Only 3 of my responders said their service dog did this for ten10 days or longer. 4. A full 75% said their Service Dog met their expectations. Encouraging! 5. All successful placements said their Service Dog immediately adjusted or adjusted within a week of placement to their new home. 6. Only 3 of my responders said their service dog has not met their needs yet. It's best to wait for a large nonprofit to help you that only provides service dogs. Attention to detail re: training specifics. Give the recipients a "books to read" before they come train with the dog. During training have written quizzes for recipient/handler for recipient. REVIEW the answers together. Give more explanation if necessary. Have written/typed instructions for what to do (EXACTLY) when you get your dog home. Research!! There are many scams out there. Get references and follow up on them. Look for a program that is a nonprofit. Some "trainers" are in it for the money. Also look for one that specializes in a couple things not everything. Research the good and the bad on everything. My short answer is DO YOUR RESEARCH / HOMEWORK. BE INFORMED! A trainer that treats the dogs as he/she would their own children. Also, in my experience, a well trained trainer teaches the dog and passes that knowledge to the human. The dog knows what is it expected if trained well, the humans are more often the problem with "problematic" dogs. If you have the time to commit, I truly believe getting the dog as a puppy and work with the trainers while training. This way the dog and the person it is getting trained for can start the binding process and get to know each other sooner..
By using a professional organization, you not only get more than one great trainer, but you have an instant family of other people in the same situation who come to training with you. I can only say you're missing out if you don't go this route. It's worth the extra funding. Make sure the trainer is 1.knowledgeable 2. respectful of your family needs 3. the right personality match with YOU!. Research the company and talk to people that have gotten a dog through the company. Speak to the owner of the company if possible to see what they have accomplished with their dogs. Check references and remember the SD is still a DOG! They are not robots! They require constant attention and work to keep up their training. But are so worth it! Choose someone who you like and who is close enough to help with ongoing training. Someone that is looking (to) help children and not all about the money. Someone that truly understands the needs of your child, or person needing the service animal. Someone who is able to meet your needs, but also exceed them. Someone caring, understanding, and knowledgable. Make they listen and you all understand what your looking for in a service dog. Just the name or title Service Dog brings the price up for dogs and training up like 300%. Don't fall for this. Get your dog to a Certified Obedience Trainer and have them work specifically with your needs. You will save thousands of dollars. My complete training cost me around 750 and my dog does exactly what I need her to do. Look for an organization that provides the dog and training. Do your research and read reviews. We chose a fantastic organization that provides LIFETIME support regarding training and/or any health issues that arise as well as a network/support group of other families that have received service dogs from their organization. Make sure your approach to animals and training match your trainers--use your instincts. Like choosing a church or neighborhood, If it doesn't feel right, it probably isn't. there are many good trainers who see the world differently than you, and have strong biases. Make sure your biases match theirs. Also, start by getting to know your local dog community. We ultimately chose a trainer that was 500 miles away, but we would never have found her without the dog training school that is 5 miles away. It was the community at the local dog school that helped me--one person knew another who knew another. Also, don't be disappointed if the first trainer/organization doesn't work. We spent 3 years looking, and ultimately tried 4 places before we found the trainer and dog that worked for us. It is not a cut and dried field--service dogs--we thought we'd go with a a large well know organization, but that did not work for us. We ended up with a very small time trainer, one person operation, and it was perfect for us. that said, there is still an incredible adjustment period with the dog in our home. She is trained, but we are not. She also needs to be retaught what we expect of her in our home. She is willing and well-prepared to learn her place, but we have to be the ones to guide her and fine tune her training. Finally, there are no real guidelines or national regulations for service dog training. You really have to research what you what, and trust the person you pick to know the best approach without national regulations. 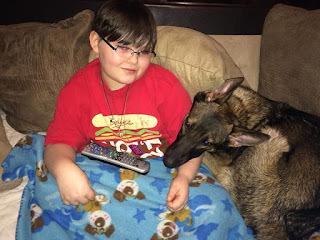 Our dog serves our 11 year old daughter with daily seizures and developmental delay. We as parents are trainers and handlers. Good luck. Track record, referrals, persistence, under promise over deliver. Get references, ask a lot of questions, and ask them in different ways see if same answer! Be specific on questions! Research, research, research. When you find a trainer/organization you think looks good, dig into them. Do Better Business Bureau searches on each one. Check out their web sites, and ask questions about their financials. Know where the money goes, and who benefits from it. Go through a large organization, 75% of the trainers are frauds. Look for someone that will continue to support you even after the dog has left their facility, is communicative, and will answer questions. Even before the dog came home, the trainer sent regular updates (photos and video), gave us reading/video material to reference and watch in order to learn how to properly handle the dog, and happily answered even the most silly of questions. The trainer helped us to become part of a whole support network of handlers and SDs and was clearly invested in what was best for each tea. Research and ask for references. Here are some links to help in your journey! A red flag is something so significantly wrong it would cause any legitimate program or trainer to cringe at the thought. Ethical programs do not operate this way. There are many factors to consider when choosing an Assistance Dog program. First, you must identify your individual needs and decide if a working dog is right for you. Every person needs to weigh the benefits of partnering with an Assistance Dog against the drawbacks. Once you have decided a working dog is right for you, finding a program that suits your needs is the next step.